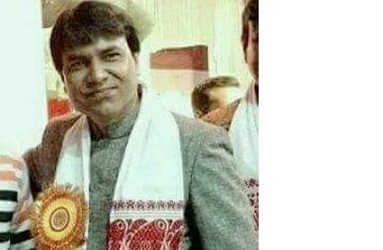 Parashuram Dubey, secretary of Assam Pradesh Congress Committee (APCC), who was also associated with various organizations of Bhojpuri and Hindi-speaking people, was cremated on Sunday at Swamsan Ghat of Dhubri. Dubey died on Saturday due to cardiac arrest at his residence in Dhubri town. Earlier, people thronged his residence despite incessant rains and marched throughout the town with his body. The Deputy Commissioner and Superintendent of Police of Dhubri, Bhojpuri organizations, several of his well-wishers paid tribute to him. His body was also brought to the district Congress office where last tribute was paid to him by the leaders and workers of Goalpara and Dhubri district Congress. A one-minute silent prayer was also performed to show honour and tribute to the APCC secretary, Dubey. Dubey, who was in his forties, was the former chairman of Dhubri Town Development Committee and was popular for his eloquent behaviour, selfless service to all castes and communities. He was also the party in-charge of the Booth Micro Management Programmes (BMMP) in Goalpara district for Assam Pradesh Congress Committee during the last Assembly election. Later, he became instrumental in regaining the East Goalpara Assembly seat for the Congress after 25 years. On Sunday, AK Rasid Alom, MLA of East Goalpara also joined the funeral at Dhubri, besides others to express his grief and mourn the death. Dhubri District Congress president Sarkar, former minister Nazibul Omar and other leaders like Abu Taher Bepari, Goalpara leaders Taj Alom, Chandan Kalita, Sirajur Rahman besides, Seva Dal, Youth Congress and Mahila Congress were also present at the party office and prayed for the departed soul of the deceased.